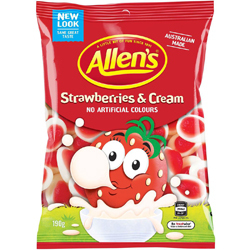 In Australia, Allens Strawberries and cream are enjoyed all round unlike as just a fad during Wimbledon. They combine sweet fragrant strawberries with thick luscious cream in a soft chewy jelly. They can be used to decorate cakes and go down great at kids parties. Also 99% fat free. Glucose Syrup (Wheat or Corn), Cane Sugar, Thickener (Dextrin Roasted Starch, Acid treated Starch or Starch acetate) (Wheat), Gelatine, Food Acid (Citric), Flavours, Colour (Carminic Acid). THESE ARE SUCH NICE SWEETS! DELICIOUS. I WILL DEFINITELY BE ORDERING MORE. These are one of my favourite Allen's sweets. They are a chewy sweet and as the name suggests they are strawberry & cream flavoured. And being 99% fat free, how can you go wrong!